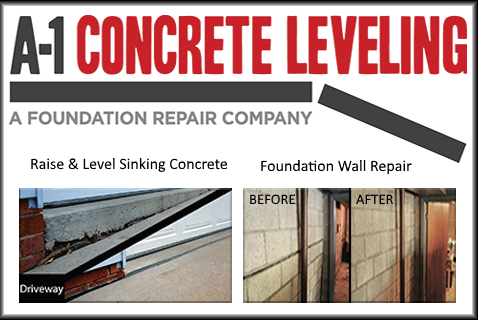 As western PA’s pioneer of concrete leveling, for 20+ years On The Level, Inc. (Your local A-1 Concrete Leveling operator) has only used an environmentally safe Limestone Grout material to perform the lifting and leveling of sinking concrete. We call ourselves a “Foundation Repair Company” not only for the ability to repair foundations and to repair sinking concrete, but all of our solutions solve issues with what’s going on underneath. With our extensive knowledge and experience with the soil makeup of the western PA/OH region, we are uniquely qualified to provide the most appropriate solutions. Drawing on that time in the field provides us a thorough perspective on how to properly resolve problems our customers deal with. We equally pride ourselves in being an environmentally compassionate company and maintaining that trust is very important to us. Our customers feel vested in our approach knowing that they are utilizing a process that replaces lost earth due to erosion, poor drainage or compaction with more solid earth. A 40+ year proven process of success. Concrete Leveling is an art. It takes years of experience and many projects under the belt to fully appreciate how intricate and difficult manipulating concrete slabs can be. One of our strengths as a company is our people. The teams that will be working on your project, (Pittsburgh, Erie or Youngstown) have logged a minimum of 6 years refining and honing their craft. Most of the team that is in the field have been with the company for over 10 years. bowing/cracked walls is the best in the industry. Likewise, our solutions for piering and lifting sinking foundations has many years of engineering experience behind it as well. Our commitment to each customer and to each project is to apply all of our knowledge, experience and quality to the best of our abilities in the solutions we provide.